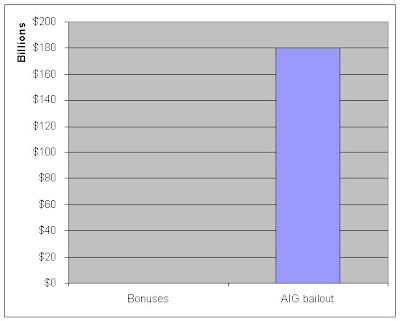 I'm going to take a devils advocate stance on this topic and say: AIG bonuses aren't that big of a deal. On the face of it the bonuses seem outrageous. How dare they give out MILLIONS in bonuses while the company is bleeding money and taking a government handout!? The bonuses have had a ton of press in the past couple days and theres lots of politicians angry over it. ITs warranted anger for sure, but focusing on these bonuses isn't going to get us anywhere. 1. The amount of the bonuses are almost TRIVIAL compared to the amount of money we've pumped into AIG. Whats that you say, you can't even see the bonuses? Trust me its there. The bonuses are just so small compared to the total $180B in bailout funds that its not even visible when put in that scale. What did AIG do with that $180B? We barely know. Yet we find out what they did with $165M and we all spend half a day venting about it. Lets keep things in perspective folks. 2. The bonuses aren't that much compared to total AIG employee compensation. Lets all keep in mind that AIG is a big company and they employ about 116,000 people. They do have to pay those people still to keep the company functioning. If we assume that the average pay is $50,000 per person then thats $5.8 billion in wages annually. This time we can at least SEE the bonuses versus the pay rate. I'm only estimating the pay levels at AIG. I'm pretty sure that this estimate is in the right ballpark though. I tried skimming AIG's 2007 annual report for information on their payroll expenses but I came up empty there. I looked at Glassdoor.com and found some salary info for AIG employees and it ranged from under $40k at the low end to well over $200k at the high end. If anyone has data on total wages paid by AIG please let me know. 3. 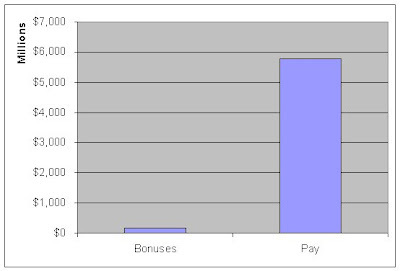 Bonuses are a normal part of pay. 4. The bonuses were part of an existing contract. The actual retention bonus contract is posted at the US House site. Note that the contract went into effect December 1 2007. SO its not as if this bonus was slipped in at the last moment after the fact. Its a long standing agreement and a contractual obligation by the company to pay it. To sum up: The bonuses aren't that big of a deal. I don't think the bonuses are exactly warranted or fair. But a lot of time work for pay isn't fair. I'm sure you've got a coworker who barely shows up yet still gets paid for it. Thats not fair, but it happens. The employer can hardly demand a refund. The government could actually tax the bonuses or do other things to recover some of that money. I'd really like to see the government should sue the executives at AIG who are responsible for the failures to recover any money they can. I think we should all be 1000 more annoyed that the government had to pump $180B of our money into AIG in the first place. AIG as a company needs to die. It should be cut up into pieces and sold off. But lets quit venting about the $165M in bonus money. Thats just a drop in the bucket.